Charlotte Mason homeschoolers strive to offer the best literary experiences to their children. Part of the recipe for an enriching literary life is a library of living books. Like food to a hungry person, living books provide fuel for thinking, motivation for learning, and a sense of satisfaction to the eager reader. A living book can spark a love for adventure, an appreciation for an artist and his art, or provide a lesson in being an everyday hero. Living books stir up the thoughts and give children (and moms) plenty to build and grow on. They open doors of the imagination and sweep away weariness. They stick with you long after you have read them…they can become part of a beloved childhood memory. They are the sorts of books you want to own and keep lined up on a shelf for future generations. As our homeschooled children reach high school age, the options for books widens and the need to choose wisely from that growing library of books is more necessary than ever. There will be trusted sources of book lists and recommendations from homeschool friends with like-minded ambitions to draw from. Now the test is going to be how you use the living books and ideas with your high school age children. Is it possible to kill a living book? I think so. I have killed plenty of good books by squeezing the life out of them with too many questions, worksheets, and over-analysis. Now that I know better, I do better…or least I try to do better. Using living books along with notebooking in high school has been the answer in our family. Notebook pages are not the same as worksheets – They provide personalized learning by keeping a record of thoughts and interesting points gleaned from reading good books. Worksheets have a preset answer in mind but notebooking helps the student make their own connections. No more true/false, fill in the blanks, multiple choice, or mindless vocabulary work. What gets written on the notebook page is straight from the child’s experience…narration at a high school level. Notebook pages can fit personal learning styles – Notebooking allows for different types of learners to share in a way that makes sense to them. 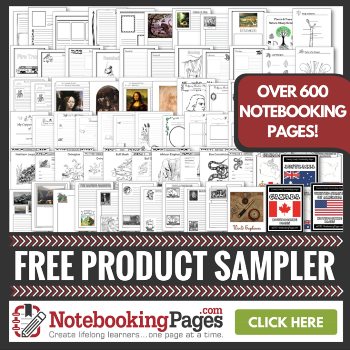 There are different styles of notebook pages to match every kind of learner. Space for as much or as little as your child is motivated to do in recording their follow-up work. The availability of free notebook pages online or reasonably priced collections make using notebook pages simple and affordable. Quotes: Living words from living books – Notebooking can be a sort of commonplace book with room for quotes, organized by topic or author. Meaningful quotes can come from fiction, biographies, non-fiction, speeches, or videos. Ask and then answer a question – High school age students should be forming relationships with books and authors, a sort of conversation with the material. Our family uses this technique with many of our history books-ask a question and then find the answer. Notebooking provides a place to organize the questions and answers. Many times these pages form the basis for a more formal writing project. No more pointless literary analysis – Much of what we do in the name of “analysis” is really just one more way to extract the life out of a living book. In our family I have noticed that as the years have ticked by, my sons have been able to easily pick up on literary terms by casual use and recording their work on notebook pages. An author’s style becomes more apparent as they read several books by the same author. They can easily describe setting, characters, and point of view. 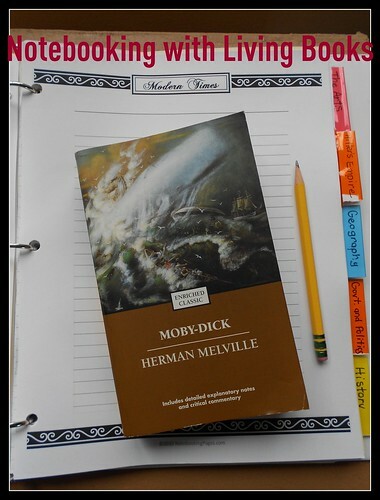 Note: I admit that we have gone to a more formal program to cover literary analysis in our senior year’s courses (IEW’s American Literature and Succeeding on the AP Literature Exam) but this was made easier by the many years of groundwork laid by using notebooking as a form of narration in middle and high school. We have not beat every piece of literature to death by analyzing it in depth. We also have done very informal and light literary analysis along with our poetry study. These are my favorite notebooking pages for customizing for high school. I especially like the History Notebooking Sets. You can buy the individual sets or you can purchase the Treasury Membership and have access to ALL the notebook pages on NotebookingPages.com. Please note these are affiliate links to products I have used in the past and loved. Highly recommend them! We have so enjoyed the notebook treasury thanks to your suggestion last year. These practical examples help me to see how we can use them for so much more. We are only beginning to use notebooking in our days. I appreciate your posts on this (and every!) topic. I have long been drawn to note booking, but I’ve been meaning to thank you for sharing your enthusiasm for note booking. Late last year after reading one of your note booking pages I finally got organised, subscribed to Note booking Pages and have note booked on a consistent basis. Thank you!! I’m still a notebooking novice and I need all the help I can get!! I love this post! Would you consider sharing it today (or any other Tuesday) at my Trivium Tuesdays link up? Thank you so much for sharing how you do this! As we get into middle school, a more thorough study of literature is on our list, and I was sort of at a loss as to how to do it. My daughter would die on worksheets, and probably wouldn’t retain much, or understand much. I really appreciate this post.